You can follow We Love Colors on Twitter and 'like' them on Facebook! They have great style tips and giveaways you don't want to miss! i love that teal color! it's a little warm here in california for tights, but i can't wait to wear them in the fall with big sweaters and boots! great post and yes, We Love Colors has some great tights!!!! i love that shade of color, too!! I have the teal ones too! I also have them in red, mint and amethyst! SO worth the money (though it's more expensive for me since I live in Canada)! I can't get enough of these tights though and I'm excited to buy my next batch! I love those tights! You look lovely! I haven't bought anything from there yet, but I plan to this fall. I always get so frustrated with tights that don't last beyond a couple of wearings. Luckily it gets so cold here that I can use ripped ones for layering, but it still feels like you just threw your money in the trash. You look super adorable, and I love the color of the tights! I loooove looking through their website at all of the gorgeous colors. I definitely need to order some tights from them soon! The pastel mint color is beautiful. And, of course, you look adorable. 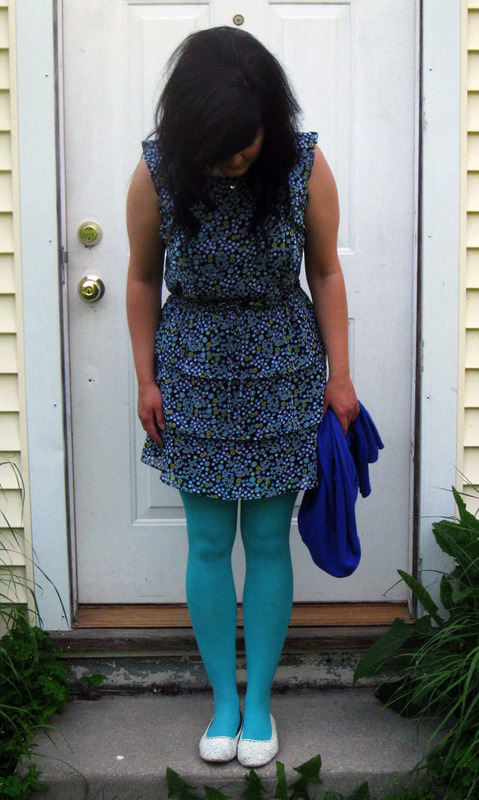 Love your review, adorable tights, I like the way you paired them with the cute blue dress. My only problem with We Love Colors is there is too much selection! I want every color, every pattern and I could not possibly afford that. I own one pair thus far, haven't actually worn them yet because of course it is hotter than sin. I'm so glad you reviewed these tights. I've had the link bookmarked FOREVER and I really want to buy some tights, but you are right, the price scared me. But after your review, I'm convinced that I'll be happy with them. Now to stop buying so many shoes so I can buy some! Thanks! hi susannah! I ordered a pair last month and also thought they were really comfortable the only thing was that they were really long for me and so they slid down a abit at my ankles and bunched alot there! did you notice this? my connection is a bit slow and the vid keeps freezing but enough to catch. i've always wanted to try these but good to see an honest review. off to their site! We Love Colors is the ONLY place I will buy my tights from now. The color selection is phenomenal and the quality is fantastic. I have at least 8 pairs of their tights now and adore them. They also have incredible customer service. A pair ripped the first time I wore them (the same color you are wearing now), and I made a mention of it on Twitter. Next thing I know they are emailing me letting me know that they will replace my tights for free! ps. your thrift finds from the other post are just adorbs! I need to go thrifting.